So we've now had a full season to watch and critique all of the hyped freshmen of Rodriguez's first full class, and no two drew more attention than Focier and Denard Robinson, the annointed saviors of the program. We all knew how Forcier did, but Denard is another story. Robinson completed only 14 of 31 passes, threw four interceptions to only two touchdowns, and ran for five touchdowns while managing the fumble the ball more than I'd like to remember--so much so that this blog had deemed him a turnover machine. Ohio State was the first team to do it, but every single play (with the exception of maybe one) that Robinon was in the game, Ohio State blitzed the cornerback that was over the slot receiver--Jermale Hines, who actually spent much of the day blitzing in an attempt to break up Michigan's rollling pockets. It took Michigan until Denard's 6th or 7th snap to finally throw the ball. It's not that Robinson should be heaving skinny posts over the middle on every play, but when you never throw the ball (even bubble screens, which he can throw well, or at least better than the mess Michigan had in 2008), there are simple things a defense can do to stop it. IMO, it took Rodriguez far too long to put the ball in the air with Robinson. Further to the point, in no way did Robinson have the full playbook, or even a fraction of it. Where were the zone reads from Robinson? Where was the speed option? Where was that quick pitch to the edge? Robinson never did any of that. In terms of the reads, I can understand if he wasn't making them fast enough and screwing the plays up. Sure. But don't you break some of those out against Delaware State? It's a really great piece, and I suggest you read the whole thing, but the long and short of it is that Michigan, when they brought Robinson in, weren't even gaining a tactical advantage in the blocking game by going to a wildcat formation. Instead, they just kept running QB draws. That's fine when you need a quarterback draw, but it doesn't make someone a quarterback--not really, anyway. This falls squarely on the shoulders of Rodriguez, that is unless Robinson was so far behind the curve in terms of reads and passing that he simply couldn't do anything else (if this is the case, though, dude needed to redshirt). Much of the speculation surrounding Robinson is that when Devin Gardner shows up on campus and sits through his presumed redshirt, Robinson will move to slot receiver/RB/Percy Harvin, which is fine, but someone needs to teach him how to secure the ball. He fumbled again against Ohio State, and I think part of the reason he has trouble holding on is because it's difficult to bring him down. Robinson stays on his feet longer than he probably should he someone has him wrapped up, and teams punch the ball out. Robinson needs to secure the ball with two hands and go to the turf when he's surrounded by six defenders. He's clearly a great talent; I just hope that Rodriguez will figure out how to use him properly. Tell the dude to tie his shoes... I mean come on now. all great points especially staying on his feet too long.They really didnt give him a chance with the one dimensional run plays almost every time he was in there.I think the msu game was the first team to really stiffle him and others just followed suit. Play up cause hes runnin. On the Ohio State fumble, they didn't punch the ball out... they simply ripped the ball out of his hands. Couple other fumbles earlier in the year were the same deal. Kid needs to get stronger, and I'm sure he will. If Denard learns the offense (option plays), he could be extremely dangerous. Imagine if he makes the right read and keeps it. A run that Focier could get 7 will be 15 (or more) for Robinson. The problem is that he hasn't learned it. I don't know if it is the coaches' fault, as you propose. I actually think it is that he just isn't learning it fast enough. Spring ball will be very important to his progress. As for his shoelaces, I think they just give fans a reason to worship. Thus, the term I coined for D-Rob lovers: Laceheads. As far as Gardner, if he is half as good as bloggers think he is (which isn't likely), then he will be one of the Top 2 QBs and will be not be redshirted. Also, with Forcier being Minor* all year, two more QBs will be needed. Gardner will have be in the 3 deep, and will have to take snaps. Simply, M needs improvement by both Forcier and Drop, er D-Rob, for M's offense to get better. I don't think Gardner is even close to being ready to help us next year. He needs to redshirt. He shotputs his short throws. If Tate doesn't progress next year (making better choices and holding onto the ball) then Denard will get more snaps. 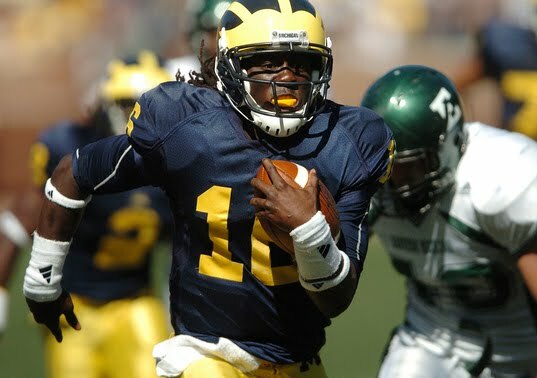 Denard is a much better fit for this offense with his running ability. If he improves in the passing game and the other aspects that are mentioned above, I wouldn't be surprised to see him replacing Tate in 2011...Gardner is the back up and Tate transfers. I agree that much of my frustration with Robinson's utilization came from the fact that there was absolutely no doubt as to what was going to happen - he was generally in an empty backfield (so there was no threat of a handoff), and this wasn't a "Wildcat". The Wildcat, at it's heart, is an option, the guy taking the snap has the option to hand it to the guy running by on the jet. So there's no mis-direction, and not even any other possibility of what he could do with the ball other than just run. I think Robinson has a strong arm, and has the tools to be a good QB. He just needs more coaching. Hopefully he gets it. I realize this may be unpopular..but that kid needs to be on the field half the game or more...he had three steps on any defender as a wideout in the OSWHO game...I like this as option A...likewise with his talent no DOUBT he played defense in HS...imagine him as a safety or cover corner...good luck burning a kid with his speed...face it, he's LOOOONG odds on playing QB in the NFL...and I KNOW this isn't NFL prep school...but let's be realistic...give the kid a chance to use his speed and talent in whatever means possible to help the team, help himself...because off center right/left isn't getting it done. Other than a broken play against WMU...his speed never had a chance to do damage. I think Robinson will be fine. The coaches just were not comfortable with him passing this year. He had a lot of catchup when it came to learning the offense. He will get to pass a lot more next year. I actually think he will end up being a better quarterback than Tate. Tate had a great year as a freshmen, but I think him enrolling early allowed him to learn the offense a lot more than Robinson. Gardner will be redshirt. He will be an excellent quarterback, but there is a lot to learn at the college level. He is extremely talented but it would benefit him more to redshirt so he has a full year with the offense without the pressure.